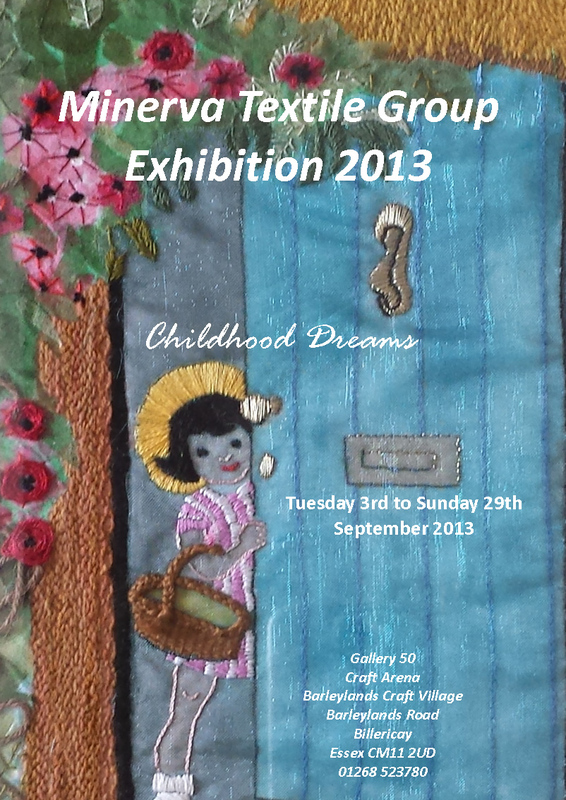 Although I have been dreaming a lot lately, this is the title of the new exhibition by the Minerva Textile Group which starts in Gallery 50 at Craft Arena on Tuesday 3rd September. Minerva consists of myself, Kay Renwick, Wendy Smith and Mandy Tinkler. We have all been drifting back to our childhood, thinking about our favourite books, stories and memories, and stitching furiously over the last few months despite the occasional interruption. I was held up a bit by the Craft Arena expansion, Wendy and Mandy have had family commitments and poor Kay fell and broke her arm and collarbone! Although she is better now, she hasn't been able to do as much as she wanted, particularly as her daughter decided to go into labour early and Kay now has a beautiful grandson to dote on. I still have a bit of stitching to do on my final piece, but my doll and memory book have been finished. I also found a piece that I stitched many, many years ago and had not finished, so I've completed that and I'm really pleased with it. The exhibitions is on from Tuesday 3rd September until Sunday 29th September during normal shop opening hours, with a private view on the evening of Tuesday 3rd September from 6.30 to 8.30. If you are free, you are welcome to come along; just let me know so that I will have enough refreshments! Minerva meets on Sunday once a month to discuss and work on our projects and to give each other support. 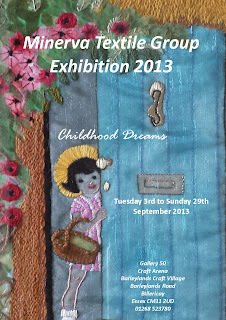 If you would like to join our group for next year, you can collect an application form at Craft Arena.